Hurray for the fabulous forties! Last night, as I watched Dara Torres furiously anchor the 400 meters medley relay, I could hear my heart pounding. I’m pretty sure I forgot to breathe that last lap. The last time my heart announced its presence that loudly was a couple of months ago, when my 40-year old body was suspended at a 60-degree angle on the sides of Half Dome, my hands holding a death grip on the steel cables. 41-year old Dara seemed to outswim her competitor Libby Trickett in that particular lap, but the Australian lead before the freestyle was just too hard for even this spunky competitor to overcome. Earlier yesterday, Dara again won silver in the “Splash and Dash”, the 50 meters freestyle, losing by a fingertip. What a phenomenal achievement, as Ms. Torres became the oldest woman to ever medal in Olympic swimming! 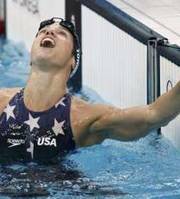 Even if veteran reporters like Ann Killion doubt her achievement (shame on you Ann, for casting aspersions without evidence), I would like to believe that Dara Torres’ win was a function of substance rather than substances. Because, as my own experiences have shown me, that is little that a 40 year old woman cannot do, if she just chooses to. Yes, there are days when it feels like the warranty expired right on my birthday, and new lines gouge themselves overnight on my face. The hairs on my pillow beg for an infusion of follicle-saving Parachute Coconut Oil. Almost every one of my peers is dealing with a nagging illness or injury, and there are days when the ol’ battery seems drained, but it hasn’t stopped any of us from reaching for goals our younger selves would have been shocked to dream about. Yesterday another 38 year old quietly got her first Olympic Medal. Constantina Tomescu-Dita of Romania surged to a significant lead early on in the women’s marathon and never gave it up. Grimacing with exhaustion, she turned around often in the last few miles, as if unable to believe the gold was within reach. In Athens, a heat stroke had forced her to drop to a walk after 20 miles, but she hobbled her way to the end, determined to finish. She placed 20th. One could justifiably argue that Constantina Tomescu was in better shape yesterday than she was 4 years ago. We are not afraid to show our gray roots and plunge into adventures that are compatible with our inner selves. My own mother experienced a renaissance of sorts in her forties, when, unencumbered by familial responsibilities, she felt free to embark on a career that was all about her, for a change. So when people tell you gloomily, “It’s all downhill from here”, consider that it might be said from the perspective of another Olympic sport – skiing! Yes, it was Michael Phelps' day yesterday, but I’d like to see him 20 years from now. Believe me, I’ll be watching from behind my coke-bottle glasses, and should he actually be competing, I’ll happily put my pounding heart at his service. This entry was posted in Features on August 17, 2008 by vpdot. Beautifully written! Yes, it’s possible to have a full life after forty, after childbirth, if you do two things – take care of your health (eat well and get enough sleep) and always, always think positively. Clinging on to your sense of wonder and curiosity won’t hurt either. A time will come when the kids grow up and your time will be yours – to climb mountains, to win at Olympics, to travel and have a full writing/teaching life as I do at 62. My students, who are young enough to be my grand-daughters now tell me that they want to be like me when they grow up, ha! Can’t agree more with Geeta!